Sideways is a feel good roadmovie from 2004 of director Alexander Payne. It takes you to sunny California. Two middle aged friends, Miles and Jack, tour in the wine country to taste wine. During the trip they sort out their lives before Jack gets married. A film with many wine tastings, failed careers, friendship and women. The film won a Golden Globe and an Oscar. 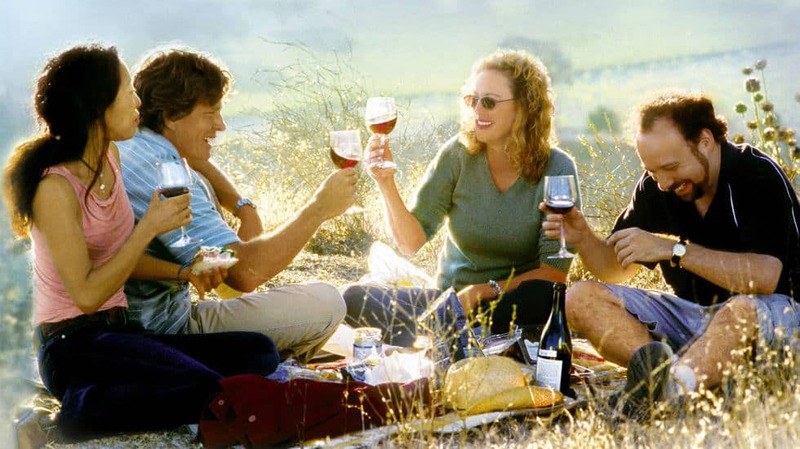 It has since become THE iconic wine film and after the release, the sale of Pinot Noir in de US rose by 14%. Ofcourse, the Cinema Culinair version of this film cannot do without a good Pinot Noir. You drink what you see in the film. Good film + good drinks + great timing. The clou is in the timing. An example. When Jack and Miles have their first wine tasting at minute 18 and 25 seconds, you do exactly the same. One minute earlier or later determines whether it's a good experience or an excellent one! The essence is to experience the film with all senses.